Sometimes I don’t want to stand over the stove and make breakfast. Sometimes I just want to stick it in the oven. 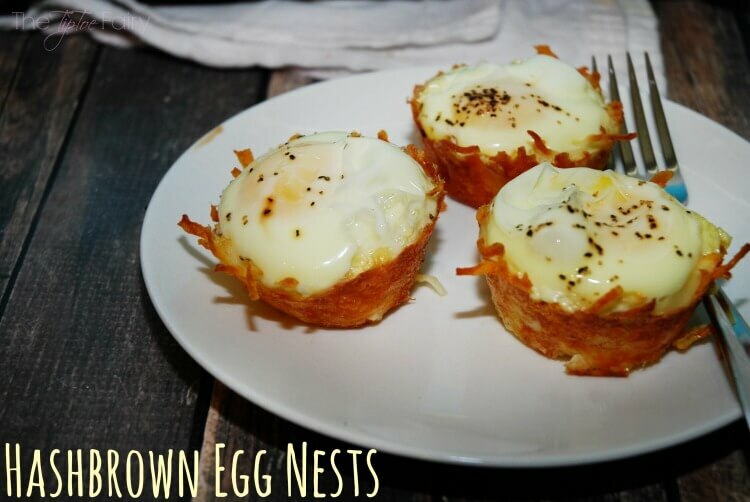 When it’s one of those days, I love to make these little hashbrown egg nests, especially when I’m knee deep in a novel, and I can’t quite reading for anything. I can quickly put these babies in the oven and sit down at the kitchen table and keep reading. Not only are these little things easy to put together, but they are just perfect to make ahead for school mornings. I make a batch on Sunday night, pop them in the fridge, and when it’s time for breakfast on Monday, I just pull a couple out and heat them. Voila! A hot delicious breakfast in 30 seconds. So after some trial and error, I can tell you that you want to spray the heck out of the muffin tins with a non stick spray. I’ve found PAM Olive Oil works THE best for this. You also want to cook the hashbrowns higher than you would think so they’ll get good and crispy. Otherwise, they stay soggy. I’ve found 425 for 15 minutes works perfectly. When it’s time for the eggs, turn the heat down to 350 degrees. If you don’t want any runny yolk, cook them for n additional 15 minutes. 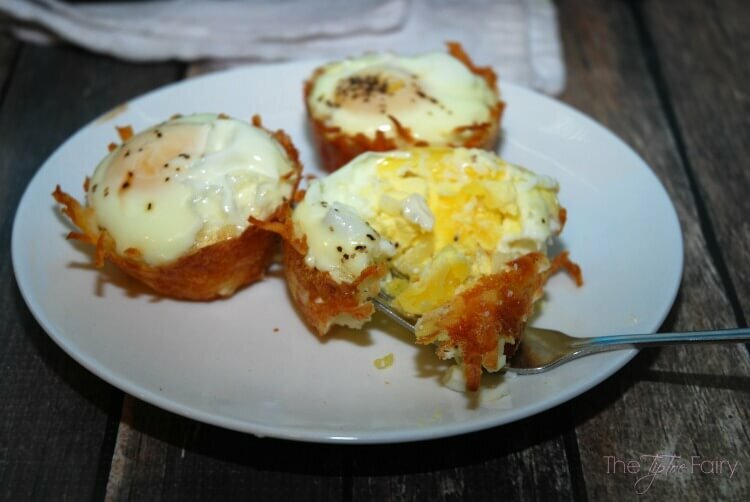 This will give you an egg somewhat like a hard-boiled type yolk. If you want some runny yolk, start checking them at the 10-minute mark, and take them out as soon as the egg white is cooked through. Preheat oven to 425 derees. Let the hash browns sit out for about an hour or so to defrost. When they are defrosted, mix wtih 1 cup of shredded cheese. Spray a muffin tin thoroughly. 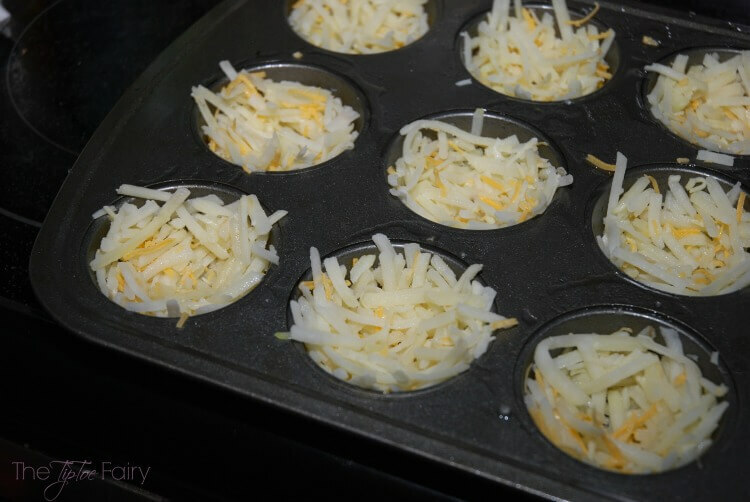 Add about a heaping tablespoon of hash browns to each muffin tin and spread it around the edges like a nest. Bake for 15 minutes or until hash browns are brown and crispy. 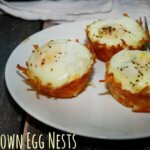 Add 1 egg to each hash brown nest. Top each egg with salt and pepper. 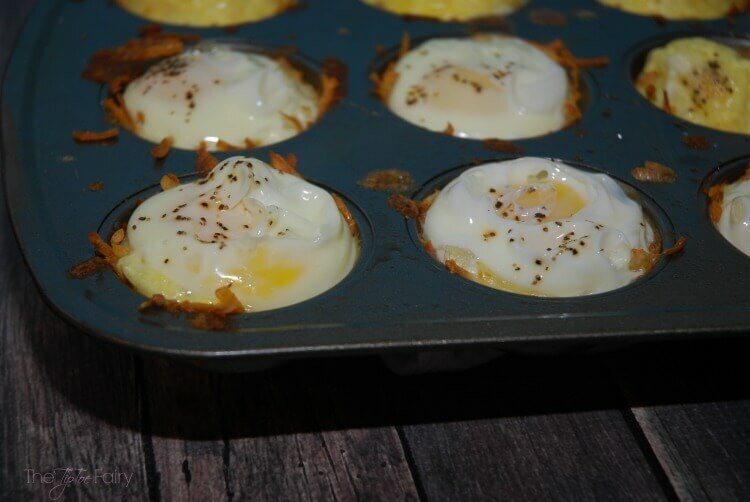 Bake for 10-15 minutes, depending on how runny you want the yolk. 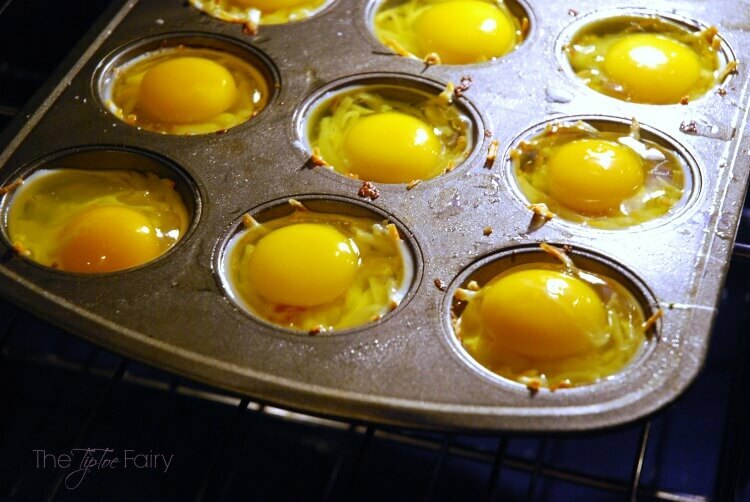 Remove from oven as soon as egg white is cooked, if you want runny yolks. Bake for 15 minutes if you want hard yolks. Remove from oven and run a knife around each nest to remove it. I hope there is a time when my kids will eat an egg like this! They make great breakfasts on the go! Great way to serve breakfast all in one dish! Love how easy these are! Definitely adding to my breakfast list. 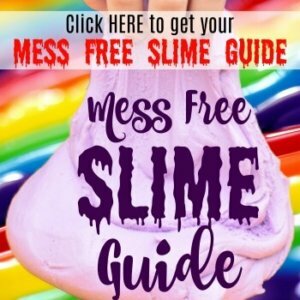 Sounds so quick and easy! Yum! Love these nests. I think my whole family would enjoy them. So perfect for Easter morning!